Grand Strand Vacations offer vacation rentals in the Myrtle Beach and North Myrtle Beach area. 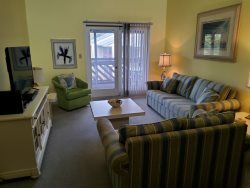 Come to Myrtle Beach with your family and stay in a lovely summer guest cottage located off of Shore Drive in the heart of Myrtle Beach's entertainment and dining areas. This spacious and comfortable two-bedroom cottage has an open living-area concept with plenty of places to relax. Cottage 20 is perfect for a large family or for a group of friends looking to spread out and enjoy a few rounds of golf. This cottage sleeps 6 people with two queen beds, one twin bed, and a queen-sized sleeper sofa. Additional features include a washer/dryer, three TV's, and parking underneath.This is a Non-smoking cottage.